Your Guide to The Best Food For German Shepherd! Do you love your doggy friend? Then you know how important it is to take care of your furry friend! And the most important thing to keep in mind is your dog’s diet. The thing is that each and every breed of dogs has a different nutritional requirement. So, it’s your responsibility to keep your doggy fit and healthy by feeding it the best foods. But before all that, you need to know what are the best foods for your dog! Today, I’ll help you figure out the best food for a german shepherd. Now, before we talk about dog foods and brands, you need to first learn about your doggy and his nutritional needs. I promise I won’t make this boring! As you may already know, German Shepherds are basically active and smart doggys. They have an amazing sense of smell, they just love to work and can even work for a long time without even getting distracted! German Shepherds are large dogs that weigh between 70 and 100 pounds when fully grown. The thing is because of their size, your German Shepherd buddy requires healthy blends of proteins, carbohydrates, fats, vitamins, and minerals. It’s All About The Food That Makes Your German Shepherd Happy & Healthy! Now that you know that your doggy friend has different dietary and nutrition needs, let’s talk in depth about some other important things. The Basic Caloric Intake: How To Not Make Your Dog Fat! Whenever I go take my dog for a walk, I see a few fat dogs on a leash. Okay, the word ‘fat’ is an understatement. The word that I’m looking for is morbidly obese! What most dog owners don’t get is that there’s something called overfeeding, which is as bad for your doggy friend as underfeeding is. You must strive to hit somewhere around the recommended caloric intake for your doggy! Let’s take a look at the caloric intake, shall we? The older dogs require about 1,200 and 1,400 calories because of their decreasing levels of energy . Do you think the caloric intake is all that you need to know? Well, my friend, you’re mistaken! The things that also count are the stuff that the calories are coming from! And that means we need to take a look at the macronutrients as well as the micronutrients. I mean, think of it this way. How healthy would you be if you eat just plain boiled pasta all day every day? You wouldn’t be healthy at all! That’s because you need more than just carbs to be healthy! Similarly, your dog needs a diet balanced in carbohydrates, proteins, and fats to be fit, healthy and happy! German Shepherds and Nutrition: All About Your Dog’s Macros and Micros! As you know, German Shepherds have really high levels of energy and so, require different caloric requirements than other dogs. Let’s talk about the breakdown! Master Your Dog’s Macronutrients: All About Proteins, Fats, and Carbohydrates! Let’s talk about the main nutrients, shall we? Well, according to AAFCO, your German Shepherd’s diet should have between 15% and 30% of high-quality fats which are animal-based. But, why should you feed your doggy those fats? Well, fats help develop healthy bones and joints, lubricate internal systems, and also help in making the necessary fatty acids which help aid digestion. So you see, fats aren’t all that bad! I’m pretty sure that you think carbs are the enemy. Especially since the mass media have created this notion that carbs are to be avoided at all costs. But, did you know that carbs = energy? Yes, the active you are, the more energy you require and the more energy you require, the more carbs you need! The same goes for your doggy friend! So, let’s talk about carbs and your doggy’s food, shall we? The sources of carbohydrate for your doggy are probably the most debated ingredient in dog foods. This is mainly because they come from different sources. German Shepherds need 5% to 8% of carbohydrates in their diet. For your German Shepherd, the best sources of carbs include carbs from sweet potatoes, rice, barley, and oats, as they’re easy to digest. These sources also have some other micronutrients as well. You need to know that low-quality dog food contains wheat based products, corn, and soy. These ingredients are known to hinder digestion so you must avoid them at all costs. According to the AAFCO, dog foods for larger breed dogs, like German Shepherd, should contain between 30% and 40% protein, of which a minimum of 22% must be of high-quality. Well, it simply means the protein you get from some actual meat sources, and not animal byproducts, the low quality expired meat or the kind of meat that isn’t fit for human consumption. Micronutrients for Your Fluffy Friend! Do you know what micronutrients are? Micronutrients are what we call “vitamins and minerals” in day to day life. They include minerals such as zinc, copper, iodine, etc. and are important for the healthy functioning of the body systems. Vitamins and minerals may amount to a tiny portion of your furry friend’s diet but they are really important for your friend’s health! The thing is that a diet that has those vitamins and minerals helps your fluffy friend maintain that shiny and beautiful coat, build up his immune system, and also to prevent negative behavioral issues, like aggression. Let’s talk sources, shall we? The best sources of vitamins and minerals are….drumroll, please… real fruits and vegetables! This includes ingredients like peas, berries, lentils etc. We’ve talked about food, but do you know how important water can be? You need to provide your doggy friend with a supply of fresh and clean water to keep him healthy and happy. All you need to do is to make sure that you’re cleaning your friend’s water bowl at regular intervals and topping the water up a few times during the day. One thing to note is that you doggy friend’s feeding schedule will change as they age. When it comes to newborn pups of about 4-6 weeks, they need to be their mother’s milk as it contains all the required essential micronutrients that you won’t be able to find in dog foods. But why should they feed off their mothers? Well, that’s because these micronutrients help build up the puppy’s immune system during the first weeks of life. At around 4 weeks of age, you can start the weaning process and feed your puppy some wet food, combined with the mother’s milk. This should be a slow and steady transition. You should ideally begin by feeding the pup small amounts of this mixture about 3-4 times per day, for about 2 weeks. After that, you can just serve the pup wet food, without the mother’s milk. Once the pup reaches 8-week mark, you can start feeding them dry kibble by adding 10% of the dry kibble to the wet one per day. This gives your puppy’s digestive system time to adjust to the change. Once your doggy friend is 6 months old, you can switch to feeding him just dry food. But, don’t forget the transition! Spend two weeks transitioning, and then feed your dog twice per day. It’s advised that you shouldn’t leave food down all day because the dogs will continue eating — running the risk of developing obesity. German Shepherds are known for having a healthy appetite but also have a fragile digestive system. That means they’re more susceptible to allergic reactions and other health problems caused by low-quality dog foods. 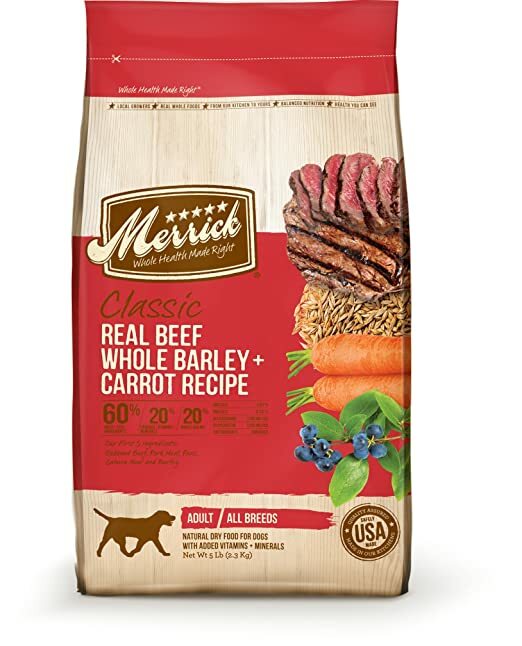 The Best Food For German Shepherd Available Right Now! Now, if you’re just too lazy to read food labels for your doggy, I have a few recommendations for you! I’ve picked out some really good products which have been tested time and again by a lot of German Shepherd owners. I’ve made a little table for you so that you can have an overview of the products that I’ve picked out for your doggy friend. Don’t forget to thank me in the comments! Now, let’s talk about all these in detail. You should also keep in mind that it’s not just the ingredient quality which matters. We should try to make a rough estimate of the food’s meat content before thinking of buying it. Have you heard about this dog food? Well, it’s a popular brand for the German Shepherd owners. Let’s talk more about it, shall we? 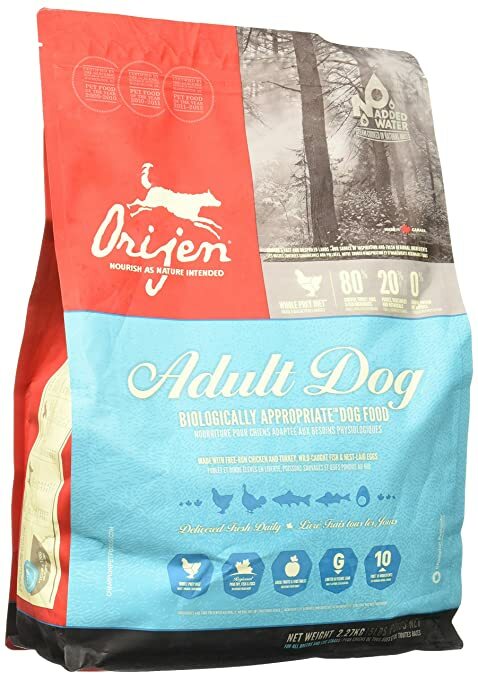 If we look at the ingredients alone, then, Orijen is one of the best foods available for your German Shepherd! It’s not just the ingredient quality that matters. This means that we also should try to make a rough estimate of the food’s meat content before rating it. This means that this food contains above-average protein, fat, and carb when you go and compare it to other foods available in the market. In fact, even when we single out the protein in the lentils, chickpeas, green peas and alfalfa, this food still has a significant amount of meat! Well, I feel that Orijen, a grain-free meat-based dry dog food which uses a lot of named meats as its source of animal protein, is a good choice for your German Shepherd! I recommended this to everyone! When you look at this food’s ingredients, you’d feel that this, too is a good choice for your doggy friend. Let’s know more about this, shall we? The fat-protein ratio is about 57%. This product also contains above-average levels of protein and fat, but contains some below average levels of carbs. This is perfect for you if your dog is older or…lazy! When you take into account the protein content in garbanzo beans, yeast, pea products, and flaxseed it makes it a type of kibble which contains moderate amounts of meat. 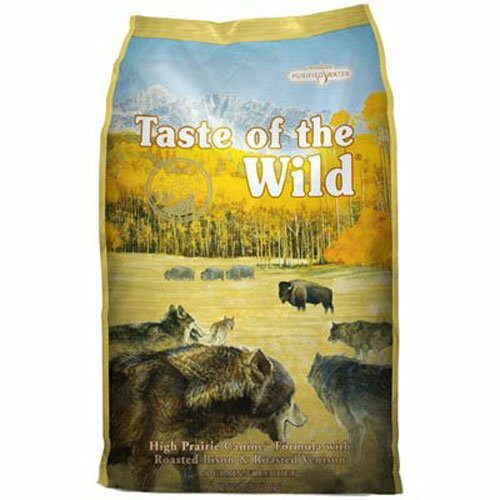 Well, I feel that the Taste of the Wild is a good plant-based dog food and it contains moderate quantities of named meats. This dog food has an above average amount of protein, a near average amount of fat, but a below-average amount of carbs in it. So, I feel it’s better suited for older or less active dogs. Looking at the protein content in pea protein, quinoa, peas, chia seed, and alfalfa this still contains a good amount of real meat. When it comes to judging a food by its ingredients, Wellness Natural Dog food is an above-average kibble. 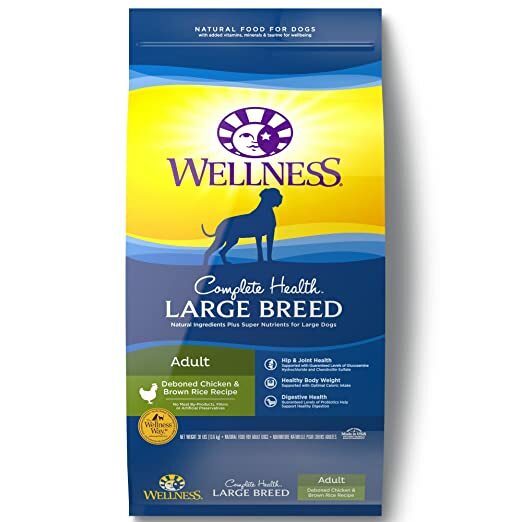 The numbers simply suggest that this product has kind of average protein, fat, and carbs when we compare it to any other dog food in the market. Singling out the protein content in flaxseed and peas, Wellness dog food still has a moderate amount of meat in it. This is one of the good foods available in the market for your German Shepherd. This is the last one on my list! When we look just at the ingredients, Precise Dog Food is an above average dry dog food product. Well, let’s translate this to something you can understand. The product contains an almost average level of protein, fat, and carbs when we compare it to other dog food. When we single out the actual protein you get from the animals, it’s of moderate level, which is great! The other source of protein in this product is flaxseed, so this means that it doesn’t contain a whole lot of plant-based protein. 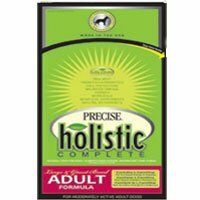 Precise Naturals is a good food for your German Shepherd if your doggy friend isn’t very active. German Shepherds are smart and doggys and love to play around and have an insatiable appetite to please their masters! But, you need to take care of them as well! It’s your responsibility to keep your best friend healthy and fit by feeding him nothing but the best dog food available. But before all that, you need to know how to pick out best foods for your dog! And I hope that this article explained that to you in detail! Because of their large size, German Shepherds need to have healthy blends of proteins, carbohydrates, fats, vitamins, and minerals in their diets. But, it’s not the calories that matter. Your doggy needs a balanced diet and so, he needs a balanced amount of carbs, fats, and proteins. I hope that this article gave you some insight into what you should be feeding your German Shepherd! If you’ve got any comments, I’m here for you!